A Liberal's Libretto: And Then, There Was One? And Then, There Was One? 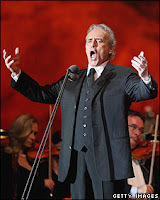 The BBC is reporting that Jose Carreras, one of the "Three Tenors", has announced his retirement from all things operatic. BUT, his management is thinking otherwise. Walking back Carreras' comments, the NY Times reports that the BBC article is false - even though Carreras is quoted as saying: “If I can do concert recitals, adapting the repertoire to my needs, then no problem. But with operas, unless the right circumstances come up, my career is done.” Not so, says Michael Storrs, the singer’s international manager. Storrs tells the BBC that Mr. Carreras would continue to perform opera if the right role came up. “It’s a complete non-story,” Mr. Storrs added.